German rabbi, apologist, and author; died at Stadthagen Sept. 5, 1715; son of Samson of Metz, where his grandfather Joseph b. Isaac ha-Levi Ashkenazi (died at Frankfort-on-the-Main in 1628) officiated as rabbi for many years. 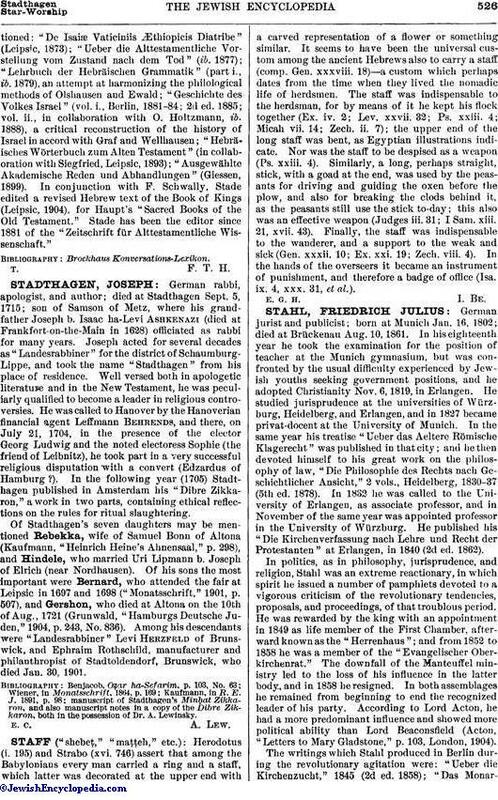 Joseph acted for several decades as "Landesrabbiner" for the district of Schaumburg-Lippe, and took the name "Stadthagen" from his place of residence. Well versed both in apologetic literature and in the New Testament, he was peculiarly qualified to become a leader in religious controversies. He was called to Hanover by the Hanoverian financial agent Leffmann Behrends, and there, on July 21, 1704, in the presence of the elector Georg Ludwig and the noted electoress Sophie (the friend of Leibnitz), he took part in a very successful religious disputation with a convert (Edzardus of Hamburg ?). In the following year (1705) Stadthagen published in Amsterdam his "Dibre Zikkaron," a work in two parts, containing ethical reflections on the rules for ritual slaughtering. Of Stadthagen's seven daughters may be mentioned Rebekka, wife of Samuel Bonn of Altona (Kaufmann, "Heinrich Heine's Ahnensaal," p. 298), and Hindele, who married Uri Lipmann b. Joseph of Elrich (near Nordhausen). Of his sons the most important were Bernard, who attended the fair at Leipsic in 1697 and 1698 ("Monatsschrift," 1901, p. 507), and Gershon, who died at Altona on the 10th of Aug., 1721 (Grunwald, "Hamburgs Deutsche Juden," 1904, p. 243, No. 836). Among his descendants were "Landesrabbiner" Levi Herzfeld of Brunswick, and Ephraim Rothschild, manufacturer and philanthropist of Stadtoldendorf, Brunswick, who died Jan. 30, 1901.
manuscript of stadthagen's Minḥat Zikkaron, and also manuscript notes in a copy of the Dibre Zikkaron, both in the possession of Dr. A. Lewinsky.